77/365(+1), a photo by Luca Rossini on Flickr. We are getting close to the goodbye day, when we’ll leave our current neighborhood, Villaggio Olimpico, for good. We’ve lived mostly happy days in this area, nothing to regret, a lot to be grateful for. I am really glad that this 365+1 project gave the opportunity to collect so many shots of the neighborhood. It’s a very personal and intimate view, mostly nocturnal as dog walking is my main non-work related activity. 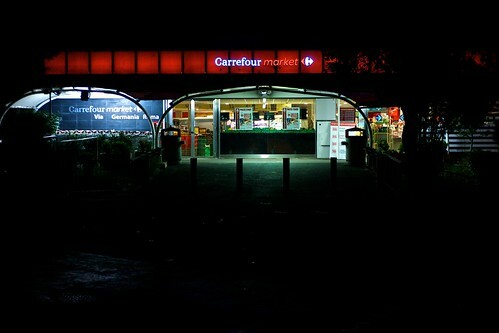 Today I finally went and took a night shot of the supermarket. It’s an important element of the area, the main source of anything we eat, drink, wash or get washed with. Villaggio Olimpico was my neighborhood when I first moved out from my parents, so this supermarket was the first place where I got the goods I needed to live. The stuff you buy when you become and independent adult. With your (very limited) money. The supermarket of your first adult-life house is where you measure your personality and discover who you want to be. The guy who drinks best alcohol but eats just eggs, the guy who goes all bio even even if it costs double, the guy who keeps eating kid junk food, the guy who takes advantage of all the possible discounts and coupons, etc. Who did I discover to be? Well, I did the most important discovery in this supermarket, I found out to be the same kind of person of my girlfriend. Who then became my wife. Who then became the mother of my child. Divergent opinions in a couple are fine, often even constructive, but not when coming to groceries.